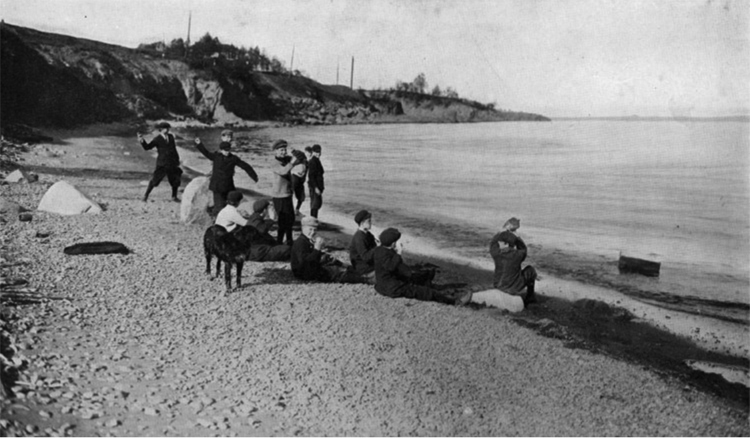 A group of boys (and one dog) skipping stones along the shore at Lake Shore Park, 1911. (Image: Tom Kasper). Perhaps due to its location along the shore of Lake Superior and because the Duluth Lakewalk passes through its heart, Leif Erikson is one of Duluth’s most-visited parks. It has also undergone more changes—including name changes—than any other park in the Zenith City. Various plans for its development in the early 1900s included expanding the park by creating new land along the lakeshore as far as the Duluth Ship Canal. While these plans never came to fruition, at least not as part of the park, today they are reflected in the recent developments of the Lakewalk and Lake Place Park. Early in 1905, a small triangle of land at the convergence of East Superior Street and London Road became the spark that ignited a community effort to create a new park on the shore of Lake Superior. The triangular sliver, roughly between Ninth and Tenth Avenues East, had already been divided into sixteen fifty-foot-wide lots, several of which were occupied by houses. In addition, the city’s board of public works was getting ready to install a large granite fountain at the westernmost point of the triangle, which extended west of Ninth Avenue. As the Duluth News Tribune explained, the new fountain would “take the place of the cheap iron affair placed in the locality by the city several years ago.” Donated by Clara Stone Blood of St. Paul, the fountain was a monument to the memory of her father, pioneer George C. Stone, who arrived in the city in 1869 to work as the cashier of Duluth’s first bank. Despite these obstacles, John Millen, vice president of the Alger-Smith Lumber Company and managing director of the Alger-Sullivan Lumber Company, offered to donate to the city one undeveloped lot in the middle of the triangular plot. Millen asked only that the city acquire the remainder of the area and dedicate it as a park. The triangle of land was soon forgotten, however, after real estate investor Louis Loeb, who lived nearby at 1123 East Superior Street, suggested that the project be enlarged to include the lakeshore below London Road. The Northern Pacific Railroad (NP), owner of the lakeshore property, offered to sell the land from Eighth to Thirteenth Avenues East for $20,000, half of its market value. The park board agreed to provide half the purchase price if Duluth citizens would come up with the rest. Other than contributing $10,000, the park board did very little to help acquire the land. Instead, Mayor Cullum took the lead. In May 1905 he called together property owners and interested citizens to discuss ways to raise money for the project, which at that point was referred to by a variety of names including East End Park, Lakeside Park, Lake Front Park, and Lake Shore Park. In June 1907 the city took ownership of the land below London Road from Eighth Avenue East to Thirteenth Avenue East. Although the park board never officially named the new greenspace, it became known as Cullum Park in recognition of the mayor’s key role in acquiring the land. Almost as soon as Duluthians unofficially named their new park for Mayor Cullum, local entrepreneurs decided that the park should be expanded into a much larger facility and named Lake Shore Park. The excitement started on January 31, 1909, when a grand new plan for Duluth’s lakefront filled the front page of the News Tribune. Inspired by Chicago’s example, which since the late 1800s had been adding fill to its lakefront to create parkland, the newspaper proposed that the City of Duluth acquire the rest of the Lake Superior shoreline from Cullum Park’s western border at Eighth Avenue East all the way to the ship canal, build a breakwater about five hundred feet out from the shore, and fill in the lake between the wall and the existing shore. The plan would be to have the government fix a harbor line where one does not now exist, to construct a concrete sea wall to mark the outer limits of the park and driveway and by a filling-in process to make solid ground where now there is water, then to go ahead with the beautification of the grounds with walks and driveways, with trees and shrubbery, fountains and flowerbeds and all things that go to make up an ideal public park. Proponents of the plan suggested that the breakwater could be constructed from boulders blasted from Point of Rocks, which engineers were working to eliminate because the massive rock outcrop obstructed traffic and divided the city in two. Sand dredged from the harbor could be used as fill. The result would be forty-five acres of new land that could be turned into a beautiful park. Not only would the project create an attractive park on the lakefront, it would also clean up the St. Croix District—the eastern portion of today’s Canal Park Business District—which at that time served in part as the city’s red light district, filled with boarding houses, saloons, and “houses of ill fame,” more commonly known as brothels. A few days later the News Tribune reported that the proposal had “created much interest and is being endorsed on every hand by Duluth people.” G. W. Preston, advertising manager of the News Tribune, received credit as the original creator of the Lake Shore Park idea. A group of local businessmen led by Albert Comstock, vice president of Marshall-Wells Hardware, offered support. Others suggested building a “sewage purifying plant” in the filled area. Park Superintendent Henry Cleveland, always ready with big plans, envisioned a public swimming pool with water warmed by a steam-heating plant that would also supply a public laundry, where poor people could find hot and cold water and facilities for doing the family washing. Encouraged by Mayor McCuen’s support, in the spring of 1912, the park board began negotiations with representatives of the NP, which controlled the rights to most of the lakefront property. In November the men reached a tentative agreement that would hand over the shoreline to the city provided the breakwater was built within three years. The newly created land was to be used for park purposes only, except for nine acres that would be deeded to the railroad. Park Commissioner F. A. Patrick strongly supported this arrangement, which, as a result, became known as the Patrick Plan.